Here's another prompt from Holidailies: describe your holiday decorating techniques. I'm not exactly sure I have holiday decorating techniques, per se, but that's not going to stop me from talking about them anyway. My whole philosophy of holiday decorating is different from how I feel about the rest of the year, and I think you can describe it succinctly as More is Better. More lights, more decorations, more of everything. Now I agree, it is possible to go overboard with this - we've all seen those houses that have so much stuff on the lawn they look like something out of National Lampoon's Christmas Vacation - but I think on the whole the principle still applies. What's important at the holidays is the spirit of things, after all. I have, historically, actually had a sort of color scheme for my holiday decorating, which fits in pretty well with the philosophy above. I collected Christmas ornaments for years, and when I got married in the late 80s what was in for decorating was the "country" look, and so half the stuff you saw at the holidays was dark dull red and antique-looking green, and white lights were the fad. So with my usual contrariness, I decided I wanted a tree that looked nothing like that at all. 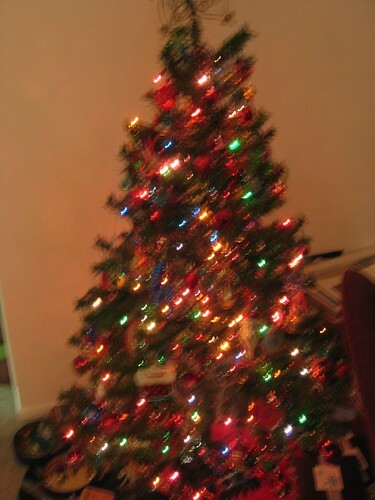 I only bought ornaments that were glitzy and bright-colored (any color, that didn't matter) and preferably metallic, and I had multicolored lights to go with that. I used to have hundreds of ornaments and strings and strings of garland and tinsel, and what I found was that the more of it you piled onto the tree, the better it looked. I'm sure it's possible to overdo there, too, but I never did think I got to that point. I used to love my trees so much - and spend so much time decorating them - that I didn't want to take them down, and they often stayed up well into January and I think at least once into February. Well, it seems fairly appropriate, on the last day of November, to show you the Christmas decorations that have gone up so far in our house. Now you have to remember that I have a lot of my mom's Christmas stuff - I got rid of a lot of stuff (ours and hers), but we still have a ton of stuff too - and I'm in the process of merging ours with hers. Here's the green tree - which is new and we bought because Rob wanted it - it's decorated mostly with the ornaments that we already had.